Come enjoy this beautiful holiday home with private pool at Carvoeiro, a famous seaside resort in the Algarve. 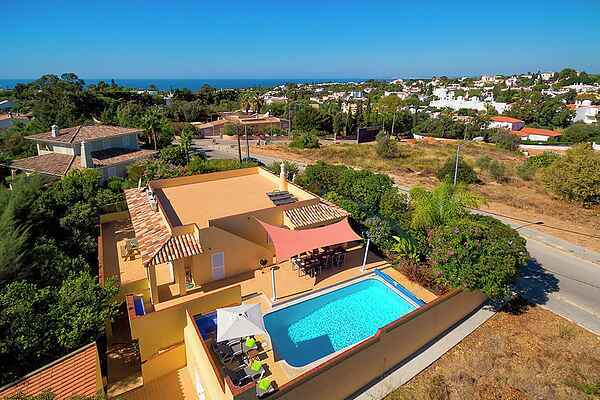 The holiday home is located between Portimão and Albufeira, just a 10-minute walk from the beach. The attractively furnished holiday home features a private garden and several, partly covered terraces. The rooftop terrace offers views over Carvoeiro, with the far Atlantic Ocean. This holiday home is suitable for 6 people. The house is fully air conditioned. You also have a heated swimming pool. This holiday home is ideal for families or groups of friends who want to spend a holiday together, but also attach importance to privacy. About 1 km from the villa is the center of the picturesque town of Carvoeiro. The nearest beach, Centianes, is about 1 km away. Nearby are Portimao and Ferragudo (10km) with beaches and marina, the resort of Albufeira is around twenty minutes away. Various golf courses are around ten minutes drive: Vala de Milho, Gramacho and Vale da Pinta. The rugged, southwestern tip of Europe Cabo de Sao Vincente is a 1.5-hour drive from the holiday home.